The core of the design of software architecture is all about architectural decision making. A high-quality design outcome sets high requirements, not only on the skills and knowledge of the design team members, but also on the management of the decision making process. We claim that in order to deliver high quality decisions, the design team needs to obtain a high level of situational awareness. To address this, we present an analysis of the problem of team situational awareness in design workshops and propose a model on how stakeholder positions help to build consensus within the argumentation viewpoint of architectural decisions. 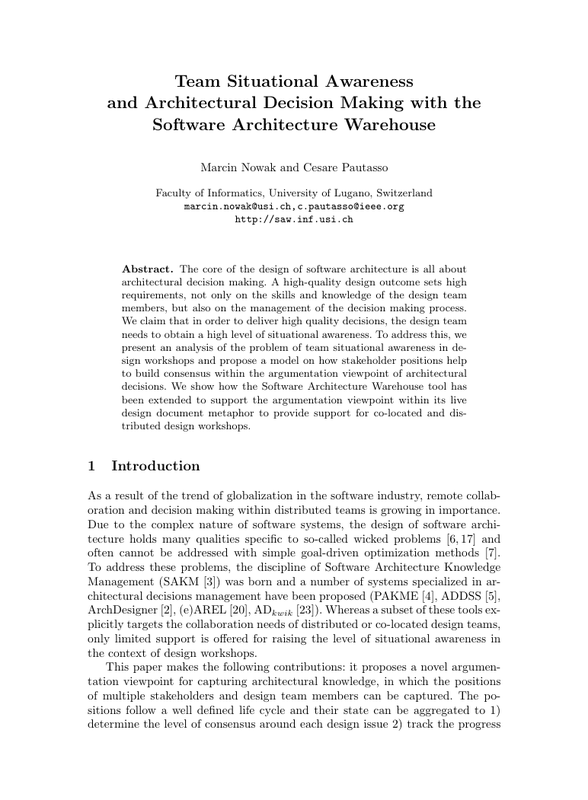 We show how the Software Architecture Warehouse tool has been extended to support the argumentation viewpoint within its live design document metaphor to provide support for co-located and distributed design workshops.